Have a look at our extensive collection of oval cut solitaire diamond engagement rings and find your perfect ring. This classic cut is the perfect addition to any wardrobe. 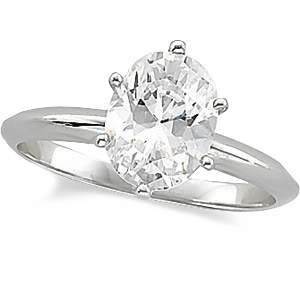 Oval cut diamonds are a classic shape for solitaire diamond engagement rings that are back in style and very popular. At CaratsDirect2U we have a very large selection of oval diamond solitaire engagement rings ranging from 0.40 – 1.70 carats, in a large range of clarities such as IF (internally flawless) and FL (Flawless) and colors ranging from D Color to K color. We also carry a range of clarity enhanced, laser drilled or K.M process treated diamonds that will allow you to get a great diamond at a much lower cost. Additionally we have natural colored Yellow, Brown and Champagne colored Oval shaped diamonds as well as Treated Blue diamonds. Feel free to browse our large collection of oval diamond rings at 25-50% off the retail price that are set in a classic 6-prong Tiffany setting in 14K white gold.